What makes a person collect art? Some have suggested that collecting is an act of acquisition, a love of possessions or pure materialism. If collecting stops here, it is selfish and without point—a squandering of time and resources. Collecting for me fulfills something far more rich and human than just accumulating objects. Ed Knippers, an artist and collector, has suggested that collecting is part and parcel with the physicality of God’s creation—it is intrinsic to being human and living in a physical world. He believes that we, as Christians from a sacramental perspective, must see the physical material world as a vessel to carry sacred meaning. After many years of compiling a collection of religious art, I have come to realize that collecting is a calling—one to which I have been asked to discover, preserve and share works of art that relate to faith. I feel strongly that our collection has real value and that it is a valuable ministry. But, before I go there, let me share a few insights about collecting. Collecting was initially a natural outcome of my own art. If one is a painter/printmaker, then seeing the creations of contemporary artists and viewing the artwork from other centuries and cultures is of vital importance. Many well-known artists have actually been collectors, including Dürer, Rembrandt and Leonard Baskin. So I stand in a long line of artists who surrounded themselves with other artists’ work. Collecting is a way to be in conversation with artists across barriers of time and culture. Their work is a whisper or hint and a personal communication to a fellow explorer, which inspires creative imagination and enriches my artistic and spiritual life. The greatest works of art may be in museums, but lesser pieces bought with care and installed in a harmonious environment inside our house retains, in some mysterious way, a touching quality which is lost in a public space. Much to the surprise of those in popular culture an interesting phenomenon occurred a few years ago. While it was generally accepted that the ‘current’ or the ‘new’ were the only things most relevant to everyday life, a wave of medieval music and art ignited the hearts and imaginations of many. Who would have imagined that Gregorian chant and the Orthodox icon would have taken hold in a culture so obsessed with the ‘avant guard?’ I believe this occurred because these artforms evoked the sacred, offering a glimpse into the transcendent. Much like great literature and music high-quality, original art can help shape us to be more profound people. We live in a culture that surrounds us with so much that is shallow and empty. Collecting art is a countercultural act. Our home is filled with images that demand something of us, forcing us to pause. Kathe Kollwitz’s Tod und Frau is a powerful, but challenging image of a dying mother being pulled by the angel of death, while her young child clings to her body, begging her mother not to leave. This is not a pretty picture. Rather, it is one of extreme depth that lingers in the heart and soul, reminding us of the tragedy of disease and early death. We need works that compel us to reflect and meditate at a deep level. Art can be a valuable resource to help meditate on the Bible in new and rich ways. A few years ago I spotted a small woodcut from a mid 16th-century German Bible on Ebay, which offered an unusual visual insight into the story of the Incarnation. Mary sits at her desk and the angel Gabriel approaches announcing that she has been chosen to bear the Son of God. On the rays of light coming from a round window the Holy Spirit descends as a dove followed by a small figure holding a cross. This figure represents the child, or seed, that will be implanted miraculously into the Virgin. The Trinity is present at the Annunciation in the following symbols: the circle for God, the Dove for the Holy Spirit and the small infant with the cross for Jesus. 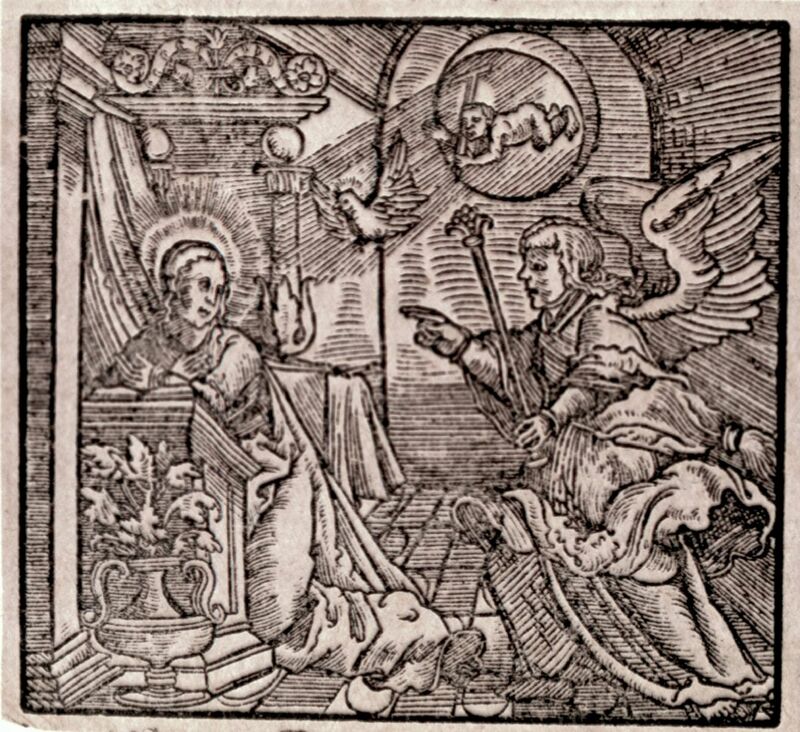 But the most fascinating thing about this woodcut is that it portrays the Incarnation taking place through the ear of Mary! The ray of light, the dove and the seed are all aimed at her ear. Why her ear? This medieval device was a way to visualize the text from the first book of John: “the word became flesh.” How do we hear the Word? Through the ear. This particular artist’s way of demonstrating this theological truth offers us as 21st-century Christians a new way to contemplate this sacred mystery. Why do collectors continue to search for and acquire great and noble works of art? One reason for collecting is that it is enjoyable. What a thrill to ‘find’ a piece, recognize its value and own it. I am always on the lookout for more art. Collecting gives focus to travel. I always have hopes of spotting that next piece in some remote location that has gone unnoticed, which will add depth and value to our collection. Nothing is more satisfying then finding a gem. I have numerous stories of locating interesting, unusual and rare pieces of art—the Paris flee market, the crammed bookstore in a back street of Weisbaden and the attic of a friend. As I look back over thirty years of collecting I remember art pieces that were literally placed in front of me in need of rescue. 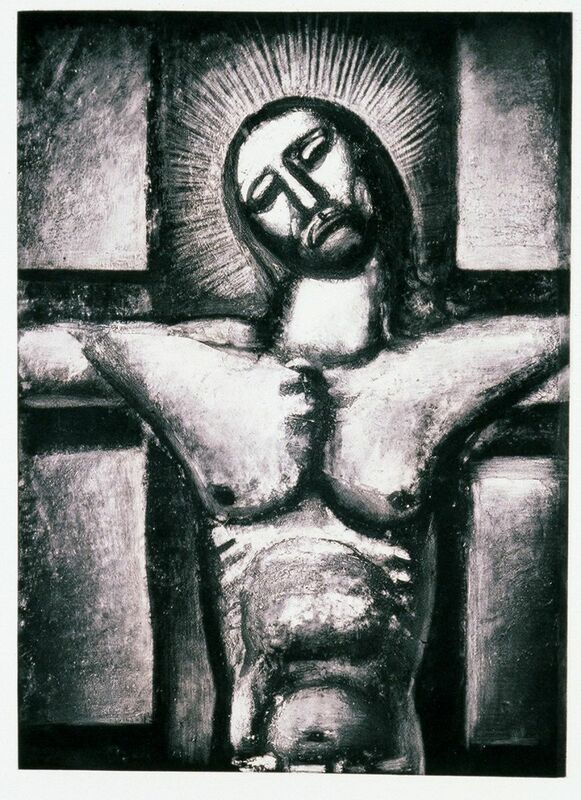 In 1983 I bought my very first Georges Rouault intaglio, He was obedient unto death on the cross, from a Jewish gallery owner in Connecticut who had terminal cancer. She had hosted a show of my collagraphs and in her home hung this striking print. She told me that her father was head of the print department at Brentano’s in New York City and had given the print to her. However, her children had vowed to destroy the piece. She begged me to purchase it from her to save the work for posterity. Little did I know that this would be a catalyst for our collection as Rouault’s work would become a major focus of our collection and in turn, as we shared exhibitions of his work, appreciation for this remarkable artist has increased in the Christian community. I think of each piece in our collection as a precious gift, one that I am to preserve. I am a caretaker, safegarding each treasure for the future, and I am ever grateful for the long line of collectors before me who have carefully preserved these artifacts. I imagine these people, wonder why they wanted to live with a particular image and marvel at how they cared for them. True collectors know that what they have bought is not really theirs. In reality a collector is one link in a chain of collectors, which traces back to the artist’s studio. We own a wonderful corpus from around 1430 AD. It is not in perfect condition as the arms are long gone and some of the polychrome is missing, but for nearly 600 years there have been anonomous individuals who believed this fragile sculpture was worth protecting. Furthermore, through wars, catastrophes and personal tragedies those individuals had enough faith to know that there would be other individuals, yet to come, who would be able to see the intrinsic worth of this crucifix. I am privileged to be in that lineage. Physically preserving the art is another responsibility of the caretaker. When I purchase works on paper, my first goal is to secure the prints or drawings in an acid free mat and place them in archival, to prevent further deterioration. It is also important to have careful records, both digitally and physically, that relate to the art. At times caring for the work requires more than simply matting or framing. One the important pieces in our collection is an 18th-century Bolivian painting of the Head of Christ which was cut from a reredos after a fire had destroyed a church. Evidence of its history is seen where scorching abraded the painting surface, but recently paint seemed to be lifting from the surface of the canvas making it necessary to have the piece restored. This is all part of being a caretaker. The lion’s share of our collection is religious, most of which are prints and paintings. Why collect biblical or sacred work, especially since this might not be the most popular tactic today? We focus on religious art for several reasons. First, this is a subject that most passionately captures our interests. It is from these pieces that our intellectual and spiritual life is enriched. These paintings and prints are visual meditations that enhance our private devotion. It is the perfect time to be collecting work with biblical or Christian themes, because the art market by in large is not particularly interested in religious themed art unless it is an outstanding artist, such as Rembrandt or Dürer, at which point it becomes an investment opportunity. A collection that has a focus, will have greater value, not just in a monetary sense, but for its total impact. Finally, it is important to gather and preserve some of these past treasures, as many of these pieces are in jeopardy. It is so important that the Chruch rediscover the value of ‘seeing’ the Scriptures—that art has tremendous potential to illuminate the Bible and inform our faith. Since the early 1990’s I have been committed to sharing our collection with as many people as possible. The first traveling exhibition of prints by Georges Rouault was under the auspises of Christians in Visual Arts. Another CIVA sponsored exhibition Beauty Given by Grace: The Biblical Prints of Sadao Watanabe, is still traveling and will be going to Tokyo in 2018. Because I so firmly believed it is important that the church becomes more familiar with its visual heritage, I have curated and organized over twenty traveling shows from what is now known as Bowden Collections including the following: Marc Chagall and the Bible; Otto Dix: Matthaüs Evangeliu; Aflred Manessier: Composer in Colors; Ecce Homo:Behold the Man; Most Highly Favored: The Life of the Virgin Mary; and Cardboard Chronicles: The Biblical Art of Rudolph Bostic. These exhibitions have been shown in dozens of churches, colleges, and universities, and museums. After more than thirty years of collecting art related to the Bible and faith, I am ever more convinced that collecting art is a calling. I am very grateful it has been part of my Christian walk. Every time I hear the Scriptures read, I have a flood of images that inform the text, almost like a moving screen before my mind’s eye. Many of these images come from our collection because they are so familiar. When you live with an image it becomes deeply embedded in the soul, ready for recall to offer visual verification to a passage. My hope is that as people encounter the art in Bowden Collections they might be richly enlightened in new ways to see the Scriptures. For centuries artists have left a visual record that faith was alive and well in their time. Historically the church and individuals were diligent in preserving these treasures. It is again time to raise up collectors, who will continue this challenge and calling of safeguarding our visual heritage.